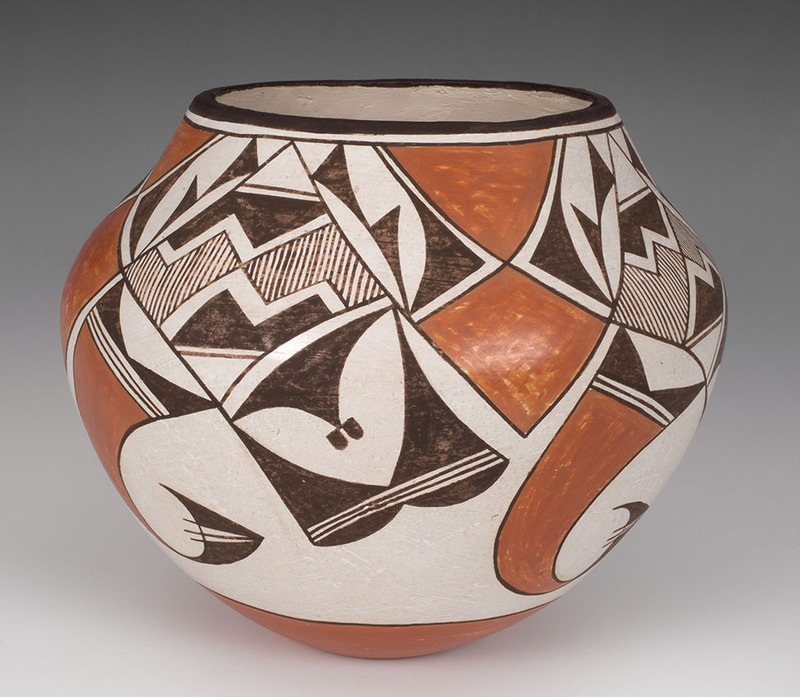 Juli Shea Towell '55 and her husband, Gil Towell, recently donated to MHCAM an amazing collection of ten primarily ceramic artworks from the Pueblo communities of the American Southwest. These objects are now on view in the Museum’s Gump Gallery alongside other ceramics from the permanent collection, including examples from the holdings of the Joseph Allen Skinner Museum. The installation is part of a year-long, museum-wide exhibition, 140 Unlimited: Recent Acquisitions in Honor of the Mount Holyoke College Art Museum’s 140th Anniversary, highlighting MHCAM’s remarkable collection and the generous response to its recent 140 Gifts campaign. AM: How did you first become a collector, or do you in fact consider yourself one? JT: Oh, yes (laughing) I am. AM: Did your parents collect? JT: No, no they really didn’t. Although, my grandfather lived in Paris. He was an opera singer, as was my father’s mother. So after World War I when he went back to Paris to close out the apartment he brought all sorts of things back which were late Victorian and early Edwardian. So there was stuff around growing up. A lot of my love for these pots comes because I really like prehistory and prehistoric painting and as a small girl I was really caught by the ancient Egyptians. Living in New York City I was taken to the Metropolitan Museum of Art to see the Egyptian artifacts. I really probably should have been, could have been--as Joseph Campbell says, if I’d “followed my bliss”--an archaeologist. Because that stuff really turns me on. AM: Was it the Puebloan pottery that drew you to collecting? JT: Yes, I think partially. We did some work for the local chamber of commerce and I got to know the local merchants. One of them was running an art gallery. One day in his window he had one of the pottery storyteller figures from the Southwest and I had just been to a church conference on storytelling and I loved that pot. It’s a woman sitting there, her eyes closed and her mouth open and a grandchild or three climbing around her as she’s singing stories. I just love that pot. Then, the gallery owner really got into Native American pots and because I had the one, I started going in to see what he had. And that’s really how it got started. AM: What are some of your favorite objects from your recent gift to MHCAM? JT: I like what Lonnie Vigil does with micaceous clay. It’s a fun shape and a takeoff on the low-shouldered San Ildefonso pots like those by Sara Fina Tafoya. I love the kind of metallic look it has. Years ago, we stayed at the old hotel in Santa Fe and the bedrooms at that point still had frescos painted right onto the wall by Julián Martinez. I loved his stuff and started appreciating the painting he’d done on his wife’s pots too, particularly with the water snake (the Avanyu). He just has a real knack for getting paint on paper. AM: What is it about the pots? JT: These objects appeal to me not only for their intrinsic artistic value, but because they represent an ancient technique of making the pots and decorating them. It’s really hard for me to tell you how deeply I feel about these things. I connect with the ceramics because pots have this exterior shell but they enclose an inner volume that is just as important. These vessels are coiled and built up from both the inside and outside and like our spiritual lives they have an interior life and an exterior life. It has a whole spiritual component for me because these potters are painting and developing these pots from somewhere sacred. Like most artists, they will tell you the inspiration comes from a deeper place within them than they can sometimes even express. And when they are most in touch with that inner piece of themselves, that is when they start producing work that is really wonderful. AM: Why did you consider MHCAM as a repository for your collection? JT: It’s my personal connection with the place. They didn’t allow double-majors when I went to Mount Holyoke. I was almost an Art History major and that’s why I say I might have been an archaeologist. I spent a lot of time at the old art building and a lot of time with the Art and History professors. The History and Art History Departments really opened up a huge amount of material for me. I considered other museums, but then I thought the Mount Holyoke College Art Museum just doesn't have that kind of artwork represented--so I offered it. It’s been a lot of fun putting this collection together, it really has.